Creating a fax cover sheet is quick and easy, with templates to choose from. First, choose a template, and then type the information that you want on the sheet. If you want to use this fax cover sheet again with the information that you've typed, consider saving it as a template. If you already have another document open in Word, on the File menu, click New from Template to view available templates. Word automatically displays available templates when it first starts. 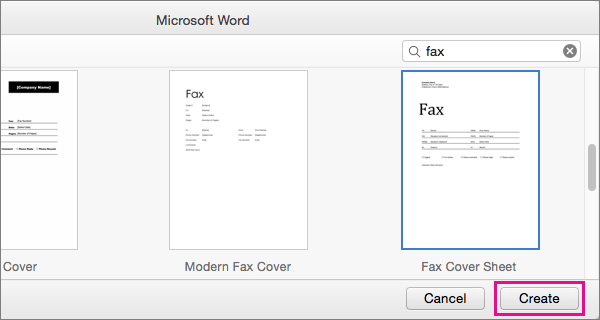 To find templates related to faxes, type the word fax in the box where Word displays Search All Templates. Select a template from the search results, and then click Create. Most templates for fax cover sheets use fields that may automatically provide some information on the sheet, such as your name. For fields that do not yet have information or for fields that you need to change, click each field and then type the required information. Remove unused fields by clicking them, and then pressing Delete. To print the fax cover sheet, click File > Print. To save the fax cover sheet for your records, click File > Save. To save this version of the fax cover sheet for future use, with the information that you've added, save it as a template by clicking File > Save as Template.